What does the future of work look like? Well, if the strides we’ve seen in the past ten years are any indication, it’s going to be very employee-focused, more ROWE than ever before and focus on the engagement of those…well, doing the work. Employee Engagement: A term we all use, yet gets defined in a myriad of ways. There are good reasons for this, namely that what is good for one company may be a detriment to others. 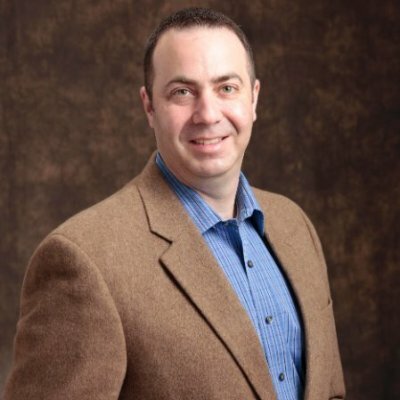 Engagement also varies from employee to employee; the cranky sales guy who vigorously debates your new policies may be more engaged the person who seems compliant but seethes silently. What is a manager to do? Above all others, HR is tasked with increasing employee engagement numbers, a figure that hasn’t gone up since Gallup started measuring it. So how do we do it? With a changing workforce, a bona fide generational shift and a number that may or may not be possible to actually budge. I mean, maybe ~30% engagement is as good as it gets? You can easily solve this with consistent, microfeedback built into your performance management plan. 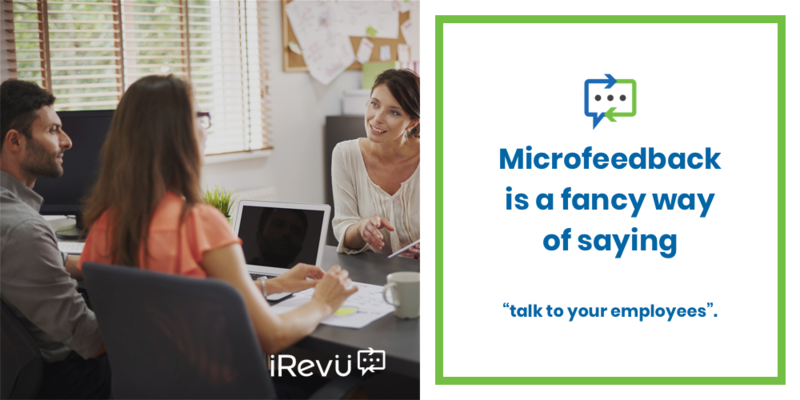 Microfeedback is a fancy way of saying “talk to your employees”. Constructive criticism and accolades are easier to give and get when you practice regularly. Stupid Simple Solution: A system like iRevü can help you plan out your performance management and feedback plan with reminders, easy integration with systems you already use and the ability to allow other managers and employees give feedback as well. Once you’ve built the habit of giving and receiving performance feedback, you can train your managers on how to give it to their employees. 75% of employees who have a best friend at work say they feel they’re able to take anything on, compared to 58% of those who don’t have a best friend at work. 72% of employees who have a best friend at work are satisfied with their jobs, compared to 54% of those who don’t have a best friend at work. Millennials (those born at any time between 1981 and 1997) top older generations when it comes to having a best friend at work. And the likelihood of having this type of connection goes down as age increases. Stupid Simple Solution: You can use feedback as an opportunity to help employees work together. Allow your people to give one another accolades and praise (save the constructive for later) so they can have their positive work behaviors reinforced and even make a friend or two. 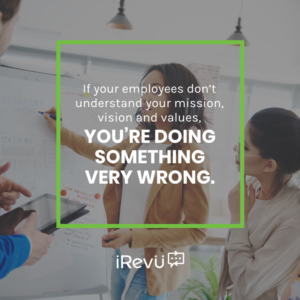 If your employees don’t understand your mission, vision and values, you’re doing something very wrong. This is onboarding and performance management 101, which is why we built values right into iRevü. Stupid Simple Solution: You can attach both accolades and criticisms to any of your values, reinforcing them to your employees AND managers. Other ways of infusing your corporate culture with values are quizzes with fun prizes, swag that shows off your values, and of course, when management lives them out. Have you ever completed a particularly difficult project or period at work and found no one noticed? Your employees have moments like that as well. Fortunately, this is one of the easiest things to remedy. 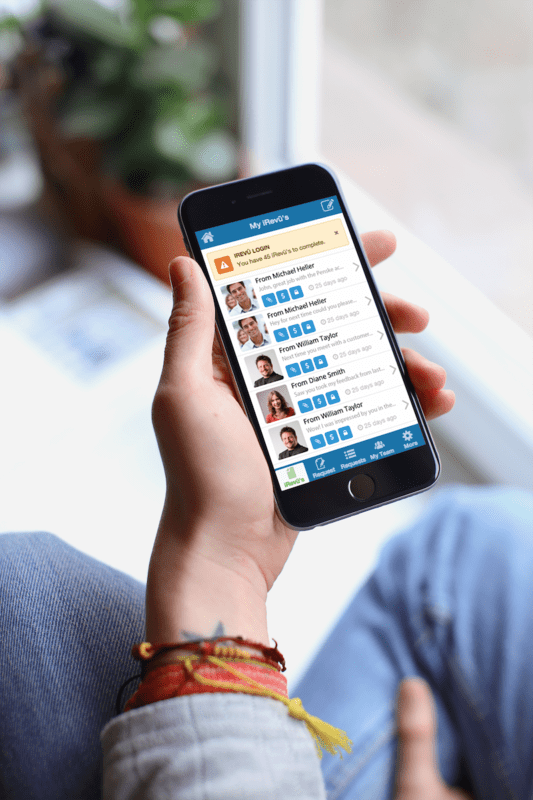 Stupid Simple Solution: You can easily send accolades through iRevü and allow managers or coworkers to view your specific and timely praise, giving them recognition. iRevü also hooks into your rewards platform, linking them for an even more comprehensive solution. Of course, all of this goes hand in hand with verbal recognition and actual rewards as well! In every workforce, the danger exists of becoming disconnected from one another. If it can happen in an office where everyone is centrally located, then it’s doubly likely to happen in a remote or distributed workforce. Stupid Simple Solution: Increase communication with video chats (because email can sometimes be misunderstood), daily check-ins with your team (in-person or digitally), and an open and transparent policy that allows your team to express when they don’t understand something.